Assistant Restaurant Managers apart from running the staff in the absence of Restaurant managers also manage and perform the following job roles – directing employees with the routine activities, act as quality control heads, overseeing the overall operations, recruiting and training restaurant employees, assisting in inventory control and budgeting, ensuring that the regulatory policies are adhered, implementing protocols, recommending ways to broaden customer traffic, ensuring compliance with regards to sanitation and creating detailed reports. Candidates seeking for this job position should demonstrate a friendly demeanor, be courteous and have the ability for quick servicing. These assistants should be well acquainted with restaurant management software and have acute management skills. 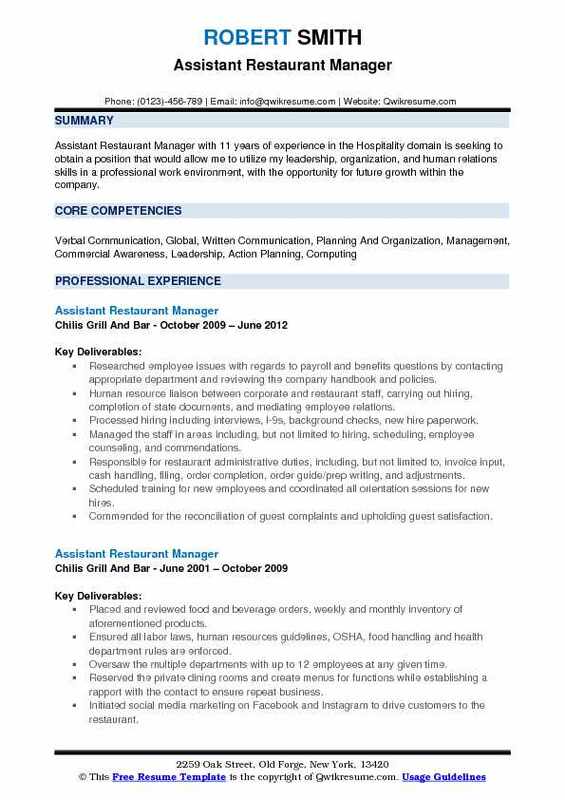 Even though no formal education is considered mandatory for this job role, eligible candidates normally depict a degree in restaurant management in the Assistant Restaurant Manager Resume. Summary : Assistant Restaurant Manager I with 14 plus years of experience in the Hospitality domain is seeking to contribute proven hospitality talents, refined communications skills, and an excellent customer service attitude to a challenging environment and to fulfill my desire to become a professional in my field of endeavor seeking to apply these talents to forward thinking company that sees its people as an asset and encourages developmental growth as well as provides structured career plans. Taking care the entire F&B operation of the Al Maya island resorts under the direct instruction of the F&B manager who is looking after Abu Dhabi Country Club Al Maya island resorts. Doing the key role for the resorts beach party with the great support of the F&B manager and the duty manager of the island. Efficiently resolving the problems or concerns to the satisfaction of all involved parties. Continually monitoring the restaurant and took appropriate action to ensure food quality and service standards were consistently met. Exhibited a thorough knowledge of foods, beverages, supervisory duties, service techniques and guest interactions. Assigning the tasks and overseeing the direction of employees to ensure compliance with food safety procedures and quality control guidelines. Optimizing the profits by controlling food, beverage and labor costs on a daily basis. Giving support to the duty manager and taking all his responsibility in the absence of the duty manager. 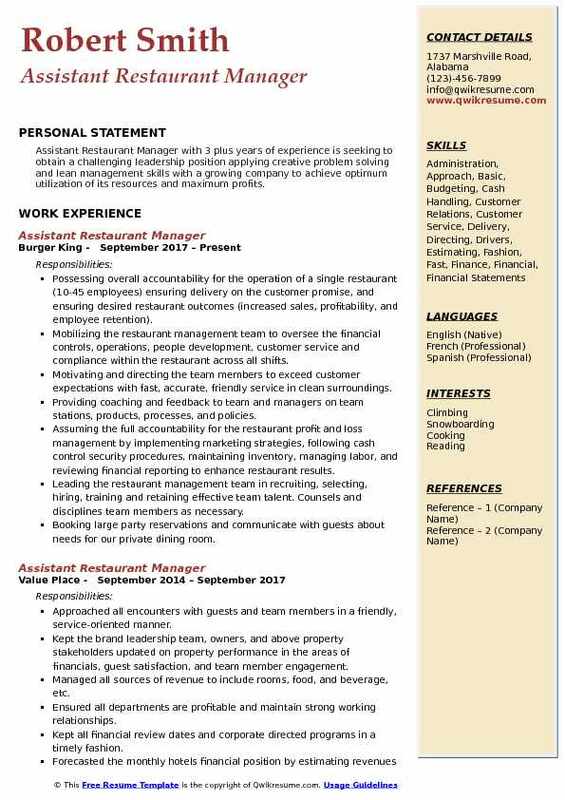 Summary : Assistant Restaurant Manager with 11 years of experience in the Hospitality domain is seeking to obtain a position that would allow me to utilize my leadership, organization, and human relations skills in a professional work environment, with the opportunity for future growth within the company. Researched employee issues with regards to payroll and benefits questions by contacting appropriate department and reviewing the company handbook and policies. 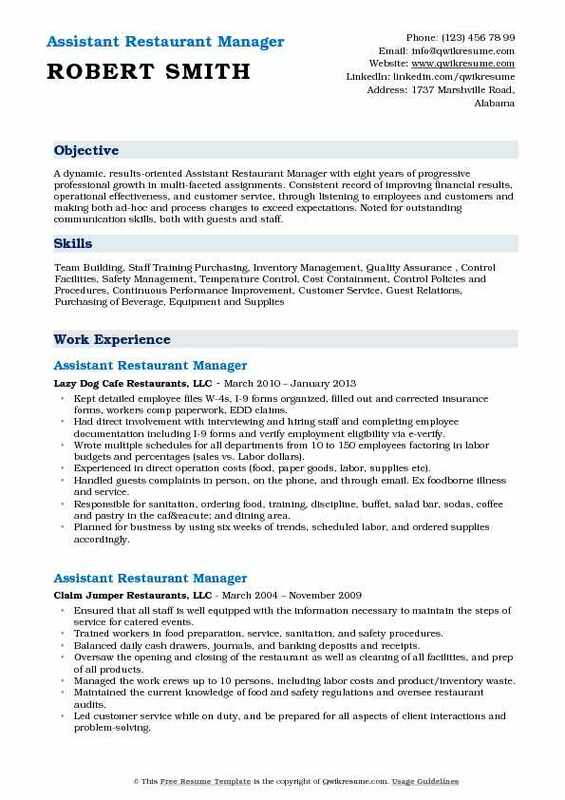 Human resource liaison between corporate and restaurant staff, carrying out hiring, completion of state documents, and mediating employee relations. 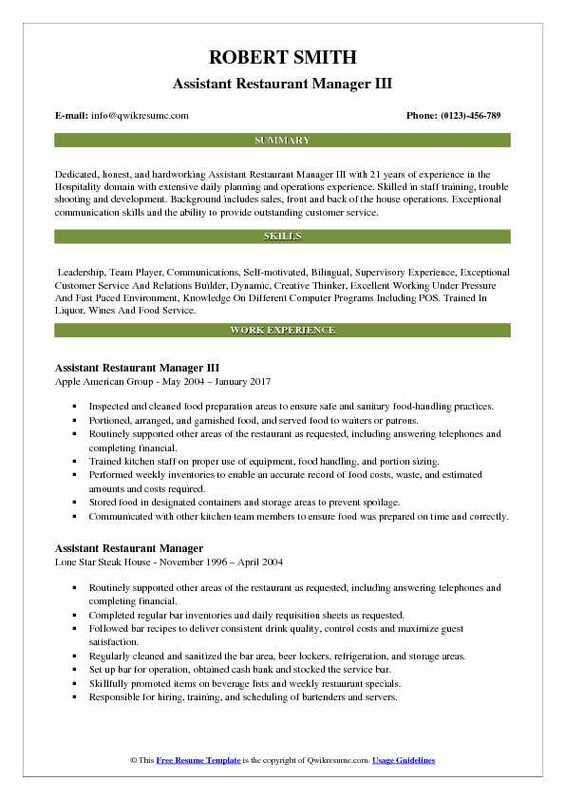 Processed hiring including interviews, I-9s, background checks, new hire paperwork. Managed the staff in areas including, but not limited to hiring, scheduling, employee counseling, and commendations. Responsible for restaurant administrative duties, including, but not limited to, invoice input, cash handling, filing, order completion, order guide/prep writing, and adjustments. Scheduled training for new employees and coordinated all orientation sessions for new hires. Commended for the reconciliation of guest complaints and upholding guest satisfaction. Control over budgeted labor costs, all while ensuring adequate staffing levels are maintained. Audited each employee file to update incomplete and missing paperwork in a timely manner. Summary : Dedicated, honest, and hardworking Assistant Restaurant Manager III with 21 years of experience in the Hospitality domain with extensive daily planning and operations experience. Skilled in staff training, trouble shooting and development. 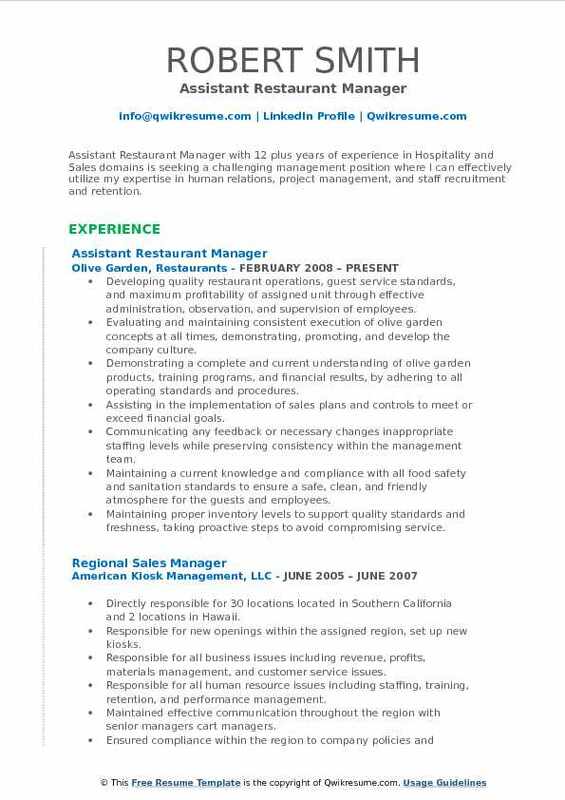 Background includes sales, front and back of the house operations. Exceptional communication skills and the ability to provide outstanding customer service. 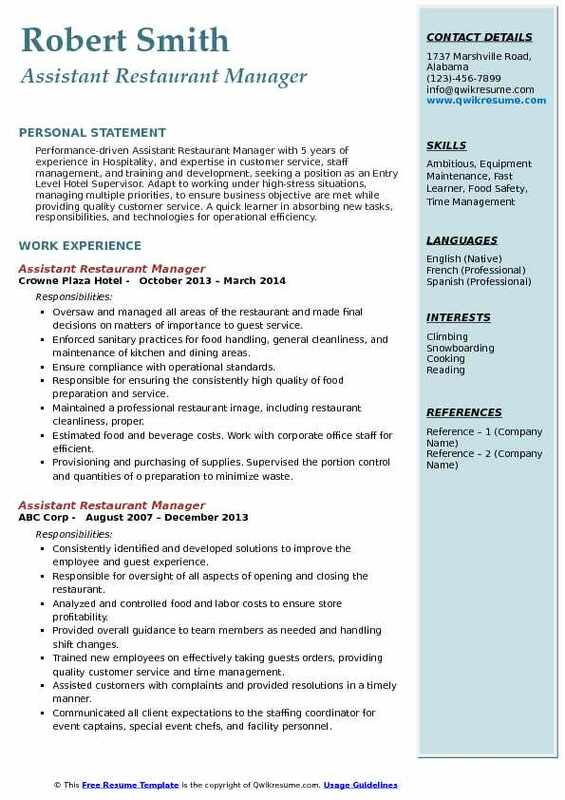 Skills : Leadership, Team Player, Communications, Self-motivated, Bilingual, Supervisory Experience, Exceptional Customer Service And Relations Builder, Dynamic, Creative Thinker, Excellent Working Under Pressure And Fast Paced Environment, Knowledge On Different Computer Programs Including POS. Trained In Liquor, Wines And Food Service. Portioned, arranged, and garnished food, and served food to waiters or patrons. Routinely supported other areas of the restaurant as requested, including answering telephones and completing financial. Performed weekly inventories to enable an accurate record of food costs, waste, and estimated amounts and costs required. Communicated with other kitchen team members to ensure food was prepared on time and correctly. Ensured the freshness of food and ingredients by checking for quality, keeping track of old and new items, and rotating stock. Supervised kitchen staff of 15 people and ensured proper food preparation, portioning, kitchen clean-up, and proper shut. Summary : Assistant Restaurant Manager with 12 plus years of experience in Hospitality and Sales domains is seeking a challenging management position where I can effectively utilize my expertise in human relations, project management, and staff recruitment and retention. Developing quality restaurant operations, guest service standards, and maximum profitability of assigned unit through effective administration, observation, and supervision of employees. Evaluating and maintaining consistent execution of olive garden concepts at all times, demonstrating, promoting, and develop the company culture. Demonstrating a complete and current understanding of olive garden products, training programs, and financial results, by adhering to all operating standards and procedures. Assisting in the implementation of sales plans and controls to meet or exceed financial goals. Communicating any feedback or necessary changes inappropriate staffing levels while preserving consistency within the management team. Maintaining a current knowledge and compliance with all food safety and sanitation standards to ensure a safe, clean, and friendly atmosphere for the guests and employees. Maintaining proper inventory levels to support quality standards and freshness, taking proactive steps to avoid compromising service. Maintaining legal compliance in all areas, which included, but not limited to, employment law, guest relations, and alcohol service. Headline : Performance-driven Assistant Restaurant Manager with 5 years of experience in Hospitality, and expertise in customer service, staff management, and training and development, seeking a position as an Entry Level Hotel Supervisor. Adapt to working under high-stress situations, managing multiple priorities, to ensure business objective are met while providing quality customer service. A quick learner in absorbing new tasks, responsibilities, and technologies for operational efficiency. Oversaw and managed all areas of the restaurant and made final decisions on matters of importance to guest service. Enforced sanitary practices for food handling, general cleanliness, and maintenance of kitchen and dining areas. Ensure compliance with operational standards. Responsible for ensuring the consistently high quality of food preparation and service. Maintained a professional restaurant image, including restaurant cleanliness, proper. Estimated food and beverage costs. Work with corporate office staff for efficient. Provisioning and purchasing of supplies. Supervised the portion control and quantities of o preparation to minimize waste. Estimated the food needs, placed orders with distributors, and scheduled the delivery of fresh food and supplies. 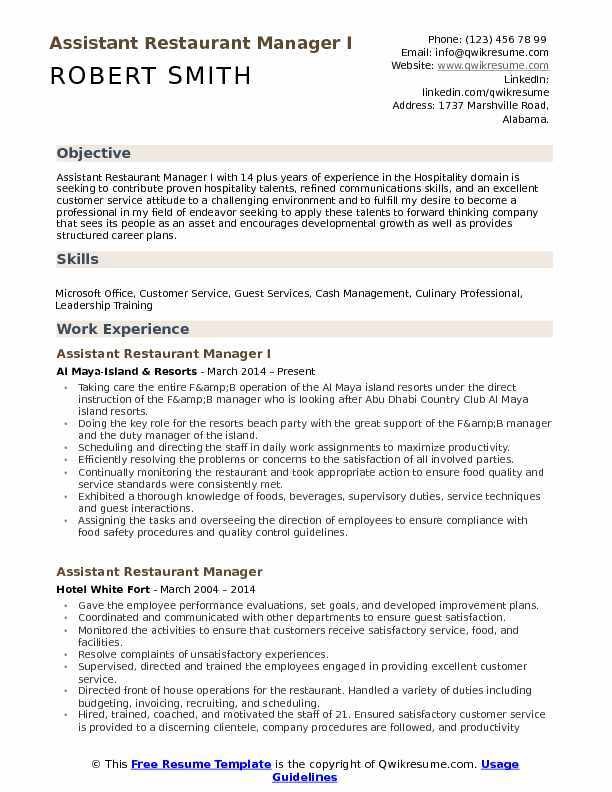 Headline : A dynamic, results-oriented Assistant Restaurant Manager with eight years of progressive professional growth in multi-faceted assignments. Consistent record of improving financial results, operational effectiveness, and customer service, through listening to employees and customers and making both ad-hoc and process changes to exceed expectations. Noted for outstanding communication skills, both with guests and staff. Kept detailed employee files: W-4s, I-9 forms organized, filled out and corrected insurance forms, workers comp paperwork, EDD claims. Had direct involvement with interviewing and hiring staff and completing employee documentation including I-9 forms and verify employment eligibility via e-verify. Wrote multiple schedules for all departments from 10 to 150 employees factoring in labor budgets and percentages (sales vs. Labor dollars). Experienced in direct operation costs (food, paper goods, labor, supplies etc). Handled guests complaints in person, on the phone, and through email. Ex: foodborne illness and service. Responsible for sanitation, ordering food, training, discipline, buffet, salad bar, sodas, coffee and pastry in the café and dining area. Planned for business by using six weeks of trends, scheduled labor, and ordered supplies accordingly. Ensured the company standards on equipment, facility, and grounds are maintained by using a preventative maintenance program. Summary : Event Designer & Catering Assistant with 13 years of experience is seeking to secure a position with an established company using my professional skills as an Assistant Catering Manager to benefit my employer. 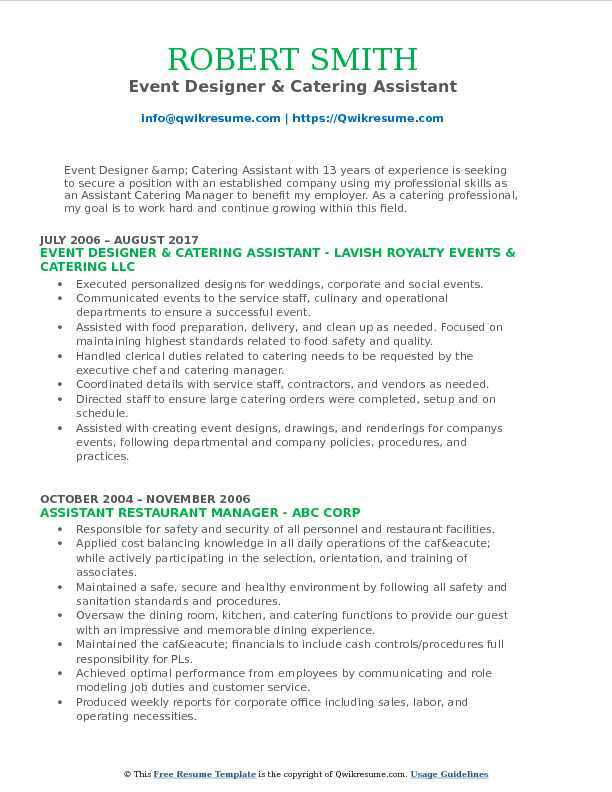 As a catering professional, my goal is to work hard and continue growing within this field. Executed personalized designs for weddings, corporate and social events. Communicated events to the service staff, culinary and operational departments to ensure a successful event. Assisted with food preparation, delivery, and clean up as needed. Focused on maintaining highest standards related to food safety and quality. Handled clerical duties related to catering needs to be requested by the executive chef and catering manager. Coordinated details with service staff, contractors, and vendors as needed. Directed staff to ensure large catering orders were completed, setup and on schedule. Assisted with creating event designs, drawings, and renderings for company's events, following departmental and company policies, procedures, and practices. Ensured creative designs satisfy the client and corporate requirements, stay within budget and are delivered within the deadline. Provided quality service with a warm and welcoming environment to clients and coworkers. Summary : Business-focused Assistant Restaurant Manager with 14 years of experience with documented recognition building effective, responsive and profitable operations within the hospitality industry. Ability to delegate responsibility while supervising and evaluating hourly and tipped employees fairly. A well-developed communicator with a strong history of training, motivating and developing employees and managers. Provide leadership while encouraging staff morale, teamwork, and cooperation. Responsible for billing and posting payable and receivable private house accounts. Responsible for breakdown of weekly sales reports, daily sales and flash sales reports. Orchestrating seating for a dining room with a capacity of up to 240 people with up to a three-point turn. Collaborated with the management team to devise and execute proactive programs/initiatives to drive process improvement, control costs, and enhance team productivity. Developed and managed front-of-the-house and back-of-the-house personnel during high-volume meal times. Ensured all recipes, food preparations, and presentations met organizational specifications and quality standards. Maintained a safe, orderly, and sanitized kitchen. Monitored food inventory, ensured adequate stock without unnecessary spend. Functioned as subject matter expert with respect to organizational products and services. Generated and maintained staff schedules. Focused efforts on controlling labor costs without sacrificing service quality. Objective : Assistant Restaurant Manager with 3 plus years of experience is seeking to obtain a challenging leadership position applying creative problem solving and lean management skills with a growing company to achieve optimum utilization of its resources and maximum profits. Possessing overall accountability for the operation of a single restaurant (10-45 employees) ensuring delivery on the customer promise, and ensuring desired restaurant outcomes (increased sales, profitability, and employee retention). Mobilizing the restaurant management team to oversee the financial controls, operations, people development, customer service and compliance within the restaurant across all shifts. Motivating and directing the team members to exceed customer expectations with fast, accurate, friendly service in clean surroundings. Providing coaching and feedback to team and managers on team stations, products, processes, and policies. Assuming the full accountability for the restaurant profit and loss management by implementing marketing strategies, following cash control security procedures, maintaining inventory, managing labor, and reviewing financial reporting to enhance restaurant results. 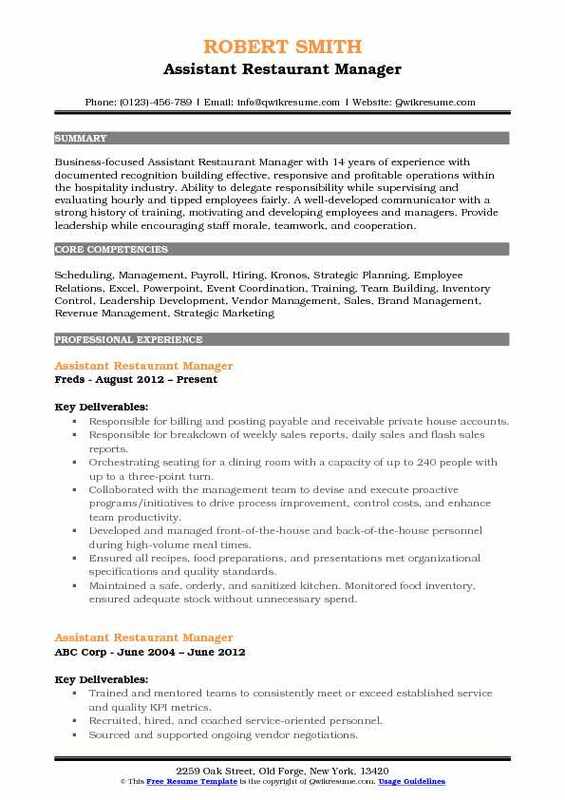 Leading the restaurant management team in recruiting, selecting, hiring, training and retaining effective team talent. Counsels and disciplines team members as necessary. Booking large party reservations and communicate with guests about needs for our private dining room. Talking with diners to ensure they were satisfied and found ways to keep them happy. Summary : Assistant Restaurant Manager II with 16 plus years of experience is seeking to obtain a position as an Assistant or General Manager in an elegant, fine dining restaurant where I can use my skills as a Team Leader and Staff Trainer to increase guest satisfaction, service excellence, and revenue. 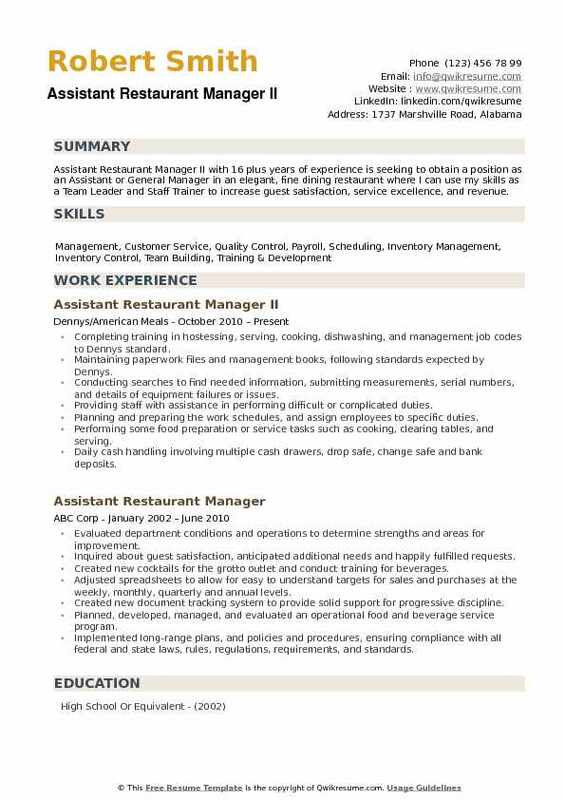 Completing training in hostessing, serving, cooking, dishwashing, and management job codes to Denny's standard. Maintaining paperwork files and management books, following standards expected by Denny's. Conducting searches to find needed information, submitting measurements, serial numbers, and details of equipment failures or issues. Providing staff with assistance in performing difficult or complicated duties. Planning and preparing the work schedules, and assign employees to specific duties. Performing some food preparation or service tasks such as cooking, clearing tables, and serving. Daily cash handling involving multiple cash drawers, drop safe, change safe and bank deposits. Performing nightly labor reports and nightly audits on registers and pos machines. Managing the customer service by training staff, overseeing operations and resolve issues in a timely manner.